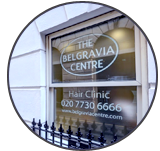 Most people who contact the Belgravia Centre are seeking advice about a personal problem with hair loss, but quite often newspapers and magazines call to ask for help with articles, too. 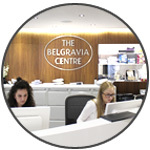 Other times, existing information on the Belgravia website and blog is borrowed by the media to add weight to their stories; occasionally Belgravia is mentioned in first-person articles by people who have been in for a consultation, too. The latest batch of Belgravia’s press articles began with a report in Cosmopolitan by a young woman named Sophie, who described her struggles with Alopecia Areata, the autoimmune disorder that leads to sudden, patchy hair loss. She explained how her hair started shedding following the breakdown of a relationship and the loss of a friend in a car accident just after her first year at university. The hairloss continued, however, and Sophie decided to visit another doctor. She was told it was likely that she had stress-related Alopecia Areata. The disease has a number of suspected triggers, and psychological long-term stress is one of them – as is shock and sudden, extreme stress. In her account of the resultant struggles of trying to come to terms with her shedding, Sophie details how she also had to deal with the hair from the rest of her body starting to fall out, too, suggesting that her condition had developed into Alopecia Universalis. A glimmer of hope came when hair started to regrow on her head around eight months ago, but it fell out again. Sophie writes that she was told upon visiting The Belgravia Centre that the pattern in which her hair had fallen out – “starting behind my ears and then snaking across my head” – indicated that there was a good chance it may never grow back. While Alopecia Areata treatment at Belgravia has certainly resulted in many success stories, this is only suitable for the scalp-only form of the condition. There are currently no truly effective treatments available for the more extreme types of autoimmune hair loss, though many are in development. Stress was mentioned again in the context of Belgravia in another article on Livestrong.com, which was looking at how men might grow thicker facial hair. “Leonora Doclis, senior trichologist at the Belgravia Centre, reports that stress can actually cause hair loss,” stated the article. Indeed it can, and not just in cases of Alopecia Areata, or – as the article referenced, beard hair loss known as Alopecia Barbae. In fact, stress is more often thought to be behind a temporary all-over shedding condition named Telogen Effluvium, which can happen when the body reacts badly to something and causes an increase in the number of hairs that enter the resting phase, before falling out. This can exacerbate or even trigger the early onset of androgenetic alopecia in men and women with a predisposition to this hereditary type of hair loss. 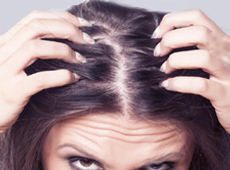 This is so as not to cause further shedding to already-vulnerable hair (many women experience Postpartum Alopecia, a form of Telogen Effluvium which follows pregnancy) and would also minimise the risk of a separate condition named Traction Alopecia, which is sometimes seen when people frequently wear very tight hairstyles or hair extensions for long periods of time. Treatment for Traction Alopecia and, for women who are not – or are no longer – nursing, postpartum alopecia treatment are both possible. 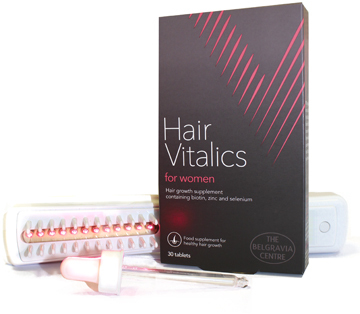 These can often help to speed up the hair growth process for women and include both pharmaceutical and non-medicinal products. For an article on WebMD, Christina Chikaher, Belgravia’s superintendent pharmacist, is quoted as saying that “some people are of course of the opinion that bald men are more attractive, so not all men have a problem with losing their hair.” The story was headlined “Tips for men to cope with hair loss” and focused on the genetic condition Male Pattern Baldness, which – despite Christina’s encouraging words – is still viewed by plenty of men as a disastrous phase in their life. Luckily, there are clinically-proven male hair loss treatments which, in many cases, can provide an effective way of regrowing a receding hairline and/or a thinning crown. Through using either or both of the key medications – finasteride 1mg and minoxidil, which are the only medications licensed by the MHRA and approved by the FDA for this purpose – formulated to inhibit the cause of hair thinning and promote hair growth, men have a viable solution for potentially preventing baldness. Lastly, the Daily Mail featured a response from Leonora (pictured) giving Belgravia’s views on the announcement of a new Help Hair protein shake “that promises to reverse hair loss”. The Mail Online quotes her explanation as to why the nutritional supplement may help to keep hair in good condition but will not stimulate hair growth. 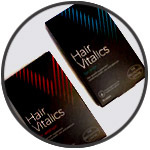 Recent media reports on studies and anecdotal evidence has also suggested that nutritional supplements, particularly whey protein shakes, that are taken in drink form may even contribute to hair loss. 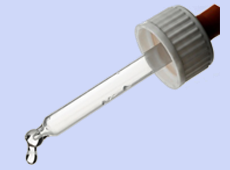 This is believed to be due to the different rates of absorption seen between liquid supplements and solid formats. 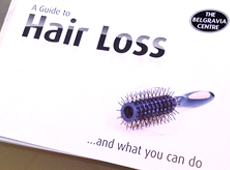 For more information on hair loss issues, visit the Belgravia blog, which is updated daily. Or, for personalised advice you can ask a question, here, or arrange a free consultation either in person at one of our Central London hair loss clinics, or via our website consultation form for those based further afield. The hair loss experts at Belgravia are regularly called on by magazine and newspaper journalists when they are writing about thinning hair and baldness, and this month has been no exception. Senior hair loss specialist Leonora Doclis was asked to comment on why men lose their hair (answer: the genetic condition male pattern baldness in the lion’s share of cases) for an article on the Mr Porter website. While the focus was on which hairstyles men should choose if they have thinning hair – the best two apparently being the French crop and a fade, with or without the high top. The writer also wanted to know if anything could be done to combat a receding hairline, losing hair on top and a thinning crown. Leonora explained that the only clinically-proven solution is medical, and pointed out that well-established drugs (finasteride and minoxidil) can help to stop shedding and encourage new hair to grow back. 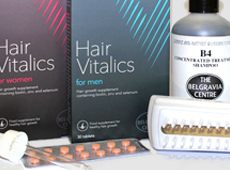 At Belgravia, most tailored male hair loss treatment courses come with important extra ‘booster’ products, specifically chosen based on the individual’s condition, level and pattern of shedding. These can include the exclusive one-a-day hair growth supplement Hair Vitalics For Men, and home-use laser device, the HairMax LaserComb to complement the action of a client’s clinically-proven hair loss treatments. The article features advice from Leonora about lifestyle choices, too; she explains how high-intensity, muscle-building exercise regimens, especially those that involve sports nutrition supplements such as whey protein and creatine, have been linked to higher levels of DHT in men. DHT, aka dihydrotestosterone, is the testosterone by-product that causes follicles to shrink around the top of the head and hairline in men who are genetically predisposed to male pattern hairloss. She adds that stress and smoking may also cause the acceleration of androgenetic alopecia. Leonora also shares her wisdom on the subject of washing thinning hair, which is something many men avoid at the first signs of shedding for fear that it will cause even more hair to fall out. “Washing hair regularly – daily or every other day – not only helps keep the scalp in good condition, but can keep your hair looking thicker, too,” she is quoted as saying. Hello magazine also quotes Leonora in a feature about scented hair mists. She advised as to one common factor that can cause the hair and scalp to smell, namely the over-production of sebum. “Sebum has the added effect of making hair oily, which in turn increases the likelihood of hair ‘picking up’ scents from the local environment,” she explained. Fellaini, of course, is the big-haired Belgian who plays for Manchester United and whose locks are so abundant they have inspired a number of terrace chants. First up were the BBC, who wanted to know what Belgravia’s experts thought about Gary Barlow’s revelation on Twitter that he had just washed his hair for the first time in 14 years. It was something of a surprise revelation that arguably had more fans going, “Eww!” than wanting to emulate his approach to shower time. As regular readers of this hair loss blog will already know, the “no ’poo” trend, as it has been called, is not something we would advise. 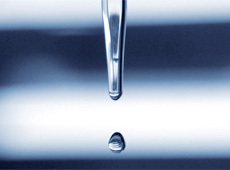 “Rinsing your hair is not going to be very effective after certain activities that make the scalp sweaty, such as exercising or using a sauna,” Belgravia is quoted advising, as well as pointing out that shunning shampoo is not going to remove bacteria from the hair or remove excess oil from the scalp if you are prone to greasy hair. Wanting to avoid potentially harmful chemicals that may be found in some shampoos was entirely understandable, we agreed, but explained that there were many great shampoo formulations out there that did not contain such harsh chemicals so were kinder on the hair and scalp. Next we were asked to settle the proverbial $64,000 question for the popular fashion and lifestyle website fashionbeans.com: how can men make their hair last longer? Senior hair loss specialist, Leonora Doclis, provided a range of advice on the causes of thinning hair, Male Pattern Hair Loss treatment, the dietary and lifestyle factors that can influence hair growth and tips for hair loss prevention. She explained that, in men who are genetically predisposed to be affected by male pattern baldness, there are also factors which can accelerate its onset or speed up the rate of shedding in those already showing signs of hair loss. These include diet, lack of exercise and “bad habits” such as smoking or regularly drinking too much alcohol. Leonora also looked at ways to try and avoid these acceleratory factors, for example, did you know that some forms of exercise can be better than others for men who are worried about losing their hair? Finally, Belgravia’s superintendent pharmacist Christina Chikaher was asked to contribute to the showbeauty.com website for an article advising women “How To Avoid Partied-Out Locks”. Among Christina’s top tips were to stay hydrated in order to keep hair frizz-free and load up on sweet potatoes to avoid or calm an itchy scalp. She also advised on choosing the right kind of alcoholic tipple to avoid greasy hair (Christina suggests that vodka is low-sugar compared to some drinks, the more sugary of which may lead to increased sebum on the scalp and inflammation). You don’t have to be a member of the press to get expert help; an initial consultation at Belgravia is free – whether it takes place in person at one of our Central London hair loss clinics, or via the Online Consultation form. During these sessions the reason for your shedding will be diagnosed, discussed with you and all of the most suitable hair loss treatment options available to you will be fully explained. As hair is often a source of pride for many women, discovering hair loss can cause acute embarrassment so it is always good to remind sufferers that they are not alone. Following Belgravia Centre client, Alya Mooro’s recent piece in The Telegraph, where she spoke frankly about her struggle with Alopecia, we caught up with her to provide further insight into her story. Alya came to us as she had been experiencing patchy hair loss, which was discovered by her hairdresser. As she explains in her article, ‘I started losing my hair at 23 and felt like a failure’. A Belgravia hair loss specialist quickly diagnosed her condition as classic Alopecia Areata; an autoimmune disorder which causes the hair to fall out in clumps. The condition is easily identifiable by the patches of scalp it leaves visible, which are often circular in shape, and can present anywhere on the scalp. Alopecia Areata occurs when the hair follicles shut down, often as the result of extreme stress or a sudden shock although the precise cause is unknown. 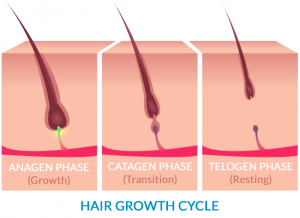 Follicles prematurely enter the resting (‘Telogen’) phase of the growth cycle, lying dormant as they await a signal to resume normal hair production. However, it is impossible to know when, or indeed if, this signal will come. Although there is no cure available as yet, Alopecia Areata treatment can be effective, particularly in the condition’s earlier stages. 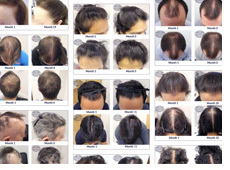 Daily applications of high strength minoxidil – a topical medication licensed for the treatment of genetic hair loss – have been seen to produce significant regrowth in many Belgravia clients in the early-to-mid stages of Alopecia Areata. This is what we prescribed to Alya at her initial consultation and photoscans were taken in order to chart her progress. She was advised how to apply minoxidil directly to the scalp in areas where hair loss had occurred, helping to stimulate blood flow and shock sleeping follicles back into action. Alya says, “It took several months to start noticing results… I felt, as I couldn’t see the back of my head – where the hair loss was, that my hair was starting to grow back“. This is why taking photoscans of clients, so that they can see what is happening and visually chart their progress, is such an important part of our service. As you can see from her images above, taken before and four months after starting her treatment course, Alya’s hair grew back, with dense regrowth apparent at the four month mark. When faced with a hair loss condition like Alya’s, although it can feel like a lifetime from starting treatment to seeing your hair start to grow, it usually takes three-to-four months for regrowth results to become visible. This timeframe generally depends on whereabouts you are in your hair growth cycle when you first start treatment. We caught up with Alya who explained how even the process of getting treatment was helpful to her. “The treatment provided routine and the opportunity to feel like you were actually doing something, contributing in some way, rather than waiting helplessly for your hair to grow, or not grow back“, she told us. If you are concerned about patchy hair loss and would like to speak to an expert about the causes and possible treatment options, contact a hair loss specialist who will be able to offer you advice and support as well as a diagnosis. A long-term Belgravia favourite, the HairMax Lasercomb features in the April issue of Marie Claire magazine, in a beauty report on ‘Ingenious Gadgets’. As part of their Beauty Power List, the UK edition of this top women’s magazine had a tester try out the laser comb’s effects. According to the piece, some of which you can view below, she reported thicker hair after just one month’s use. Marie Claire heralded the the LaserComb hair growth-boosting device – which is offered as part of most of Belgravia’s comprehensive hair loss treatment courses for men and women – as one of ‘this year’s hottest hi-tech beauty gizmos’, including it alongside other salon-quality, home-use gadgets like the Clarisonic. The HairMax LaserComb is an award-winning handheld device that uses gentle laser therapy, known as LLLT, to boost hair growth. Suitable for home use, when it is combed through the hair, the gadget’s teeth help to part the hair, allowing low level laser light, emitted from the comb to get straight to the scalp, where this laser therapy helps to stimulate the hair follicles and increase blood flow to the scalp. This in turn helps to both reduce hair loss and promote hair growth by encouraging dormant hair follicles out of their resting (Telogen) phase and back into the active stage of the hair growth cycle. In addition to being included with many of our annual treatment plans, this FDA-cleared LaserComb is also used during our Clinical Therapy sessions. If you are experiencing thinning hair and are interested in how hair growth boosters, such as the Laser Comb, may work for you, speak to a hair loss specialist. They will be able to diagnose the reason for your shedding and advise on the best way to combat your hair loss condition. Whilst hair growth boosters can help to improve the condition and health of the hair, as well as promoting quicker regrowth, they cannot tackle the root cause of many conditions, such as genetic hair loss. There is, however, a medically-proven hair loss treatment for women available, called minoxidil, which often produces promising regrowth results and works well in conjunction with these booster products. If you would like more information on the LaserComb or a personalised treatment plan based on your specific type and stage of shedding, give the Belgravia Centre a call on 020 7730 6666 or drop us a message to book your free consultation. 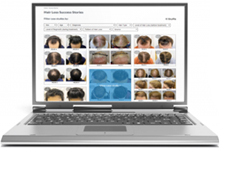 Alternatively, if you are unable to visit one of our Central London hair loss clinics, simply complete our Online Consultation for further assistance. Which LaserComb Model Should I Buy? What Exactly Are Hair Growth Boosters?